The key point I will stress with out-fielding is to attack the ball. By “attacking” the ball I mean you come towards the ball if it is hit to you, rather than standing still and waiting for it. If you can do this, it puts more doubt in the batsmen’s mind. A common catch-cry is “walk in with the bowler”, which is very important. As the bowler is running in about to bowl, you as the fielder should start walking in from a few steps behind your original fielding position. 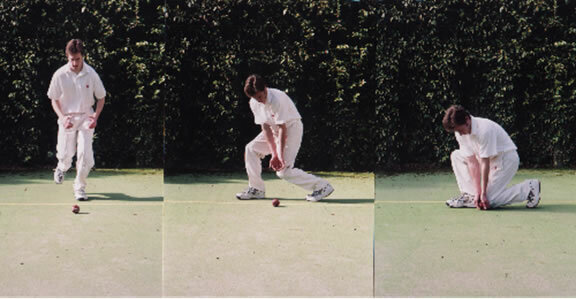 When the bowler releases the ball, a good idea is to stop and “spring” with your knees. This allows you to transfer you weight of either foot, enabling you to react to the left of the right. Chris Harris is one that uses this technique of “springing”. The main technique used to stop balls along the ground is called the “long barrier”. This occurs when your body forms a “barrier” behind the ball, giving the fieldsman the best chance of stopping the ball. Make sure you keep your eye on the ball right up until the point it reaches you, as it could be costly. It is demonstrated below. When throwing, it is important to transfer your weight from the back to the front foot, much like a javelin thrower. 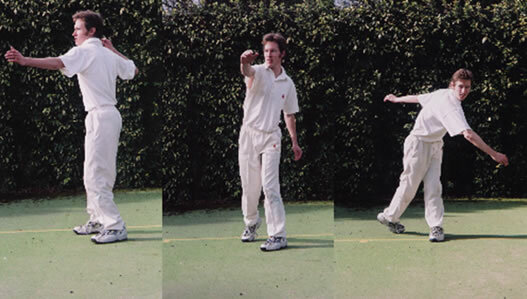 Use your non-throwing arm for aiming (and to steady yourself) and your front foot in the direction of the target. Swivel from your back to your front foot. Practice accuracy rather than power, as chances are you will field in the inner circle at the start of an innings. This calls on accurate throwing especially if a run-out chance occurs.